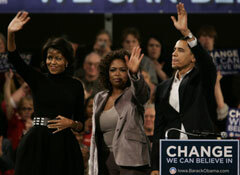 You are here: Home / Politics & Government / Oprah Winfrey declares Barack Obama "the one"
Oprah Winfrey declares Barack Obama "the one"
Thousands upon thousands turned out at two rallies in Iowa on Saturday to hear media maven Oprah Winfrey publicly declare that Barack Obama is "the one." Winfrey has never before endorsed a presidential candidate, but there’s now no doubt she is backing Obama’s bid for the White House. Winfrey made her first, very public declaration on Saturday afternoon at a rally in Des Moines that drew over 18,000. "I’m here to tell you, Iowa: he is the one," Winfrey said. "He is the one." Winfrey delivered a nearly 20-minute-long speech, articulating her vision of America and the role she believes Obama can play in turning things in a different direction. "I not only care about this country, but there are times that I even worry about what happens to our country and that is why for the very first time in my life I feel compelled to stand up and to speak out for the man who I believe has a new vision for America," Winfrey said. Jumping into the political fray made her nervous, Winfrey told the crowd. "And it feels like I’m out of my pew, I’m out of my terrain. Back stage somebody said, ‘Are you nervous?’ I go: ‘You damn right I’m nervous,’" Winfrey said. "Yes, I am ’cause I’ve never done this before, but if we continue to do the same things over and over and over again, I know that you get the same results." Winfrey, who said she had voted for as many Republicans as she has Democrats over the years, said she doesn’t often have politicians on her syndicated talk show because it’s hard to "penetrate" the veil of their rhetoric. Winfrey didn’t suggest fans of her TV show, magazine or other ventures would back Obama automatically because she is, but she prodded those who were in the audience and beyond with these words. "I am not here to tell you what to think," Winfrey said. "I am here to ask you to think, seriously." Winfrey scoffed at the notion Obama should have "waited his turn" and let other, more experienced hands ahead in line for the presidency. "We must respond to the pressures and the fortunes of history when the moment strikes and Iowa, I believe that moment is now," Winfrey said. Without naming Obama’s rivals by name, Winfrey questioned those who stress their D.C. experience and fault Obama’s. "The amount of time you’ve spent in Washington means nothing unless you’re accountable for the judgments you’ve made with the time you’ve had," Winfrey said, praising Obama for being against the war in Iraq "from the beginning." Winfrey quoted the Bible at one point and called Obama a "rare" type of politician. "A politician who has an ear for eloquence and a tongue dipped in the unvarnished truth," Winfrey said. Obama, for his part, called Winfrey a women "who moves an entire nation each and then he launched into a speech that ended with this: "Iowa, our moment is now," Obama said. "America, our moment is now." You may listen to Winfrey’s entire speech by clicking on the audio link below.